My research within the CNQO group at Strathclyde focuses on the interaction between light and atoms cooled down to very low temperatures. Indeed, nowadays lasers enable us to control atomic motion with unprecedented precision or achieve states of matter never observed before. I am particularly interested in the rotation of the atoms and, therefore, I consider special kinds or structured lasers beams. Understanding such opto-mechanical phenomena can be beneficial to the development of new nano-technological devices for future computing or imaging. When atoms are driven by an intense enough laser an interesting phenomenon typically occurs: they self-organise in spatially ordered structures. The origin of such spontaneous appearance of patterns is very general and has been observed in many different systems, e.g. patterns on animal furs or oscillating chemical reactions in fluids. The ones we study belong to the realm of Atom Optics, i.e. light and moving atoms. With mathematical and computational techniques, we address the simulation of the behaviour of such atoms in motion. 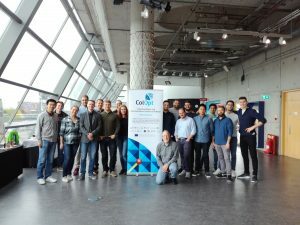 During my stay at Strathclyde, I will exploit the opportunities provided by the ColOpt network to compare our theoretical predictions with experiments and investigate with our collaborators possibilities for technological applications. Deep connections and exchanges are expected with our academic colleagues at the University of Glasgow (UK), Muenster (Germany) and the industrial partner HoloEye in Berlin (Germany). The new ingredient in our theoretical study is the role of Orbital Angular Momentum (OAM) of light, responsible for the macroscopic rotation of atoms. Understanding how OAM modifies the self-organisation of atoms will deepen our knowledge of atomic collective phenomena, i.e. where the behaviour of a large group of atoms is highly different from that of a single atom. Moreover, considering effects explained by quantum mechanics we can compare our simulations with state-of-the-art experimental studies. Giuseppe was born and educated in Sicily, the southernmost region of Italy. He studied Theoretical Physics at the University of Palermo, where he graduated in October 2016. 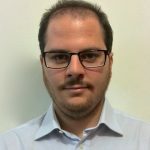 For his master’s project he focused his research on the foundational aspects of the theory of Open Quantum Systems, under the supervision of Prof. Antonino Messina. During this period, he spent some months abroad in Poland, collaborating with Prof. Dariusz Chruściński at Nicolaus Copernicus University in Toruń.